Just returned from AMS/SMT 2018 where I got to hear stimulating research, see old friends, and make new ones. I'll be speaking at UC Davis in January as one of their Valente Series guests. If you are in the area, come by! Event info HERE. Returning to Traverse City next summer (2019) to work with Parallel45 as sound designer / engineer for their exciting three-production summer season. My two most-current pieces (Hiraeth, and Study in Randomness) have been uploaded, if you want to give them a listen (HERE). Developing new composition, theory and technology courses; and getting the computer studios up and running here at Cal State East Bay. With dreams of starting an East Bay Laptop Orchestra. If you know of anybody in the Bay Area that would be interested in getting this started with me, have them reach out! I'm happy to announce my new position as Assistant Professor of Composition and Music Theory at Cal Estate East Bay. Excited for the move to the Bay Area, and to get started! The live recording of Hiraeth, my latest work for piano and chamber ensemble, is now available. Jason Hardink and the rest of the ensemble did an incredible job. I am so very thankful for their time and talent. In other good news, I have been invited to participate in UC Davis' Valence Lectures in January of 2019. More information on this will be posted shortly -- stay tuned! my music featured in the Lexical Tones Podcast! The Lexical Tones Podcast, hosted by Robert McClure, offers a weekly conversation with a guest composer, performer, and/or artist creating new works of contemporary art/music. Each creative supplies three adjectives about their work or themselves, and Rob tries to discover additional connections through discussion and listening examples (several complete compositions). These conversations often focus on aesthetics, technique, process, meaning, perception, and the musical origins of the featured guest. Please subscribe to the Lexical Tones Podcast on iTunes or find them on Soundcloud and Stitcher to get new episodes as soon as they are released. St. Francis College Professor of Fine Arts and flutist Roberta Michel performed with accompaniment by pianists Mirna Lekiƈ and Andrea Lodge my new piece for flute(s) and piano: Sound Imagert No.6 at the Concert at Half Past Twelve, The Flute Through the Ages, II on Monday, October 23 in the College's Founders Hall. More information about the program and the performers, HERE. Happy to announce that I will be presenting my current research at Society for Music Theory's national meeting (SMT 2017), to be held in Virginia from November 2nd to the 5th. I will be presenting along with my fellow coauthor Nicholas Nelson. The title of the paper is "Near-Symmetry: A Theory of Chord Quality with Implications for Voice Leading". I am very happy to announce that Nova Chamber Music Series has commissioned me a chamber piano concerto for their 40th anniversary season to take place in the Spring of 2018. Exact date TBA! NOVA’s current Artistic Director, Utah Symphony Pianist Jason Hardink (who will be performing my piece) was appointed in the fall of 2009. Under his leadership the series has deepened relationships with Utah composers while broadening NOVA’s profile nationally through commissions and recordings of works by composers Curtis Curtis-Smith, Jason Eckardt, and Michael Ellison. Since 2009 NOVA has featured collaborations with Utah Symphony Music Director Thierry Fischer, soprano Celena Shafer, and the PLAN-B Theatre Company. Cambridge Scholars recently published Form and Process in Music (An Analytic Sampler), a book in which I contributed a chapter, and helped edit. Basic information below. And HERE, the website if you want to purchase it. Form and Process in Music, 1300–2014: An Analytic Sampler draws together papers delivered at the 2014 meeting of the West Coast Conference of Music Theory and Analysis. The conference spanned an unusually wide spectrum of musical styles, including papers on European twelve-tone music after the Second World War, fourteenth-century music, pop music and jazz, the music of living composers, narrative and characterization, and the history of music theory. The title of the book reflects the large span of musical cultures that are represented within, but also accounts for the common thread through all of these essays, a strong emphasis on understanding the forms and processes of music through analysis. The reader will find within it a compendium of analytic techniques for numerous musical styles. This is a bit late, but I'm pleased to share that I was featured, along with fellow GC composition student Elizabeth Adams and GC Faculty member Dr. Jeff Nichols in The Wall Street Journal for our participation in a concert at the Tenri Cultural Institute on Saturday, October 17th, 2015. Part of the “Anti-Capitalist Concert Series” founded by GC composer Elizabeth Adams and composer Julie Harting, the theme of income-inequality was the point of inspiration for each new composition. The article, entitled “Turning Wonky Economic Graphs into Chamber Music,” delves into the specific inspirations behind each new work, including quotes from the composers and photos from the event. The concert featured the Cadillac Moon Ensemble performing, as well as a discussion led by Chad Kautzer, a professor at the University of Colorado, Denver. 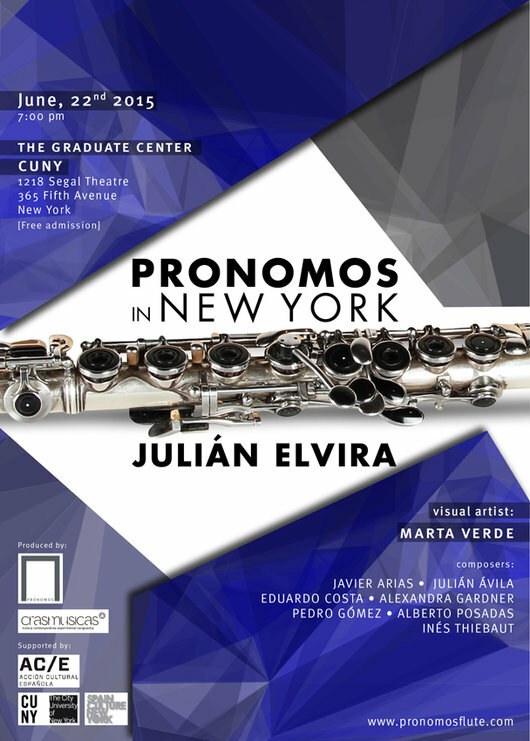 Featuring Julián Elvira and his Prónomo flute. My piece Promissus received its Spanish premiere. Featuring The Cadillac Moon Ensemble, premiered new works by Jeff Nichols, Leung Chi-Hin, Julie Harting, Elizabeth Adams and myself. Willow Place Auditorum, Brooklyn, NY. InsideOut Gallery, Traverse City, MI. cuncta fluunt got a new performance from Jane Sheldon, soprano and Roberta Michel, flute(s). El próximo 12 de diciembre de 2015 tendremos la oportunidad de escuchar en Madrid una magnífica selección de piezas compuestas expresamente para flauta Prónomo, de la mano de su creador Julián Elvira. El repertorio cuenta con obras de compositores españoles de gran prestigio como los premios nacionales de música José Mª Sánchez-Verdú y Alberto Posadas, pero también promueve la creación de jóvenes compositores que se encuentran en pleno auge de su carrera, como Julián Ávila e Inés Thiebaut. El programa se completa con tres obras versionadas por el propio Julián Elvira para flauta Prónomo, que no sólo reflejan la capacidad de este nuevo instrumento como interfaz capaz de convertirse en otras flautas, sino también la reflexión sobre cómo interpretar obras clásicas con instrumentos de vanguardia en la actualidad. Este concierto se incluye dentro de la séptima edición del Ciclo de Conciertos de Solistas Fundación BBVA, coordinado y ejecutado por el conjunto instrumental PluralEnsemble. 1/2 your hourly wage, pay what you think is fair, pay what you want. I'm very excited to be a part of this series. Below, the press release, for your information! I hope you can all make it. See you there! 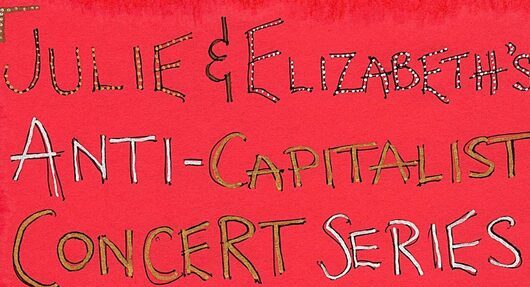 Income inequality is the focus of the next concert of Julie & Elizabeth's Anti-Capitalist Concert Series. New music quartet Cadillac Moon Ensemble will premiere pieces by composers Jeff Nichols, Julie Harting, Chi-hin Leung, and Inés Thiebaut whose compositions were inspired by graphs showing income inequality. The graphs will be projected during the performances. The concert will also feature spoken interludes and conversation led by Chad Kautzer, Associate Professor of Philosophy at the University of Colorado, Denver and author of the book “Radical Philosophy: An Introduction.” Kautzer sees inequality as a foundational element of capitalism. “Capitalism transforms everything it comes in contact with into conditions for its own reproduction and, more specifically, for the accumulation of capital. Capitalism emerges under conditions of great inequality, and it can survive only by reproducing such inequality.” Chad Kautzer, Radical Philosophy (2015). The concert is the fourth concert produced by “Julie and Elizabeth’s Anti-Capitalist Concert Series,” a new music concert series founded by composers Julie Harting and Elizabeth Adams. The series programs music and conversation to stimulate thought and discussions around an anti-capitalist economy. In addition to the four premieres, Cadillac Moon Ensemble will perform Nicholas Deyoe's “fl/vn” for flute & violin and an excerpt from Annie Gosfield's “Daughters of the Industrial Revolution” for cello and percussion, a piece inspired by her grandmother who worked in sweatshops in the Lower East Side. My piece alcmaeon (fl, vln, perc) was performed. My piece cuncta fluunt performed with dance! "Time Notations: Silence, Words, and Music"
The Cadillac premiered my new piece alcmaeon, for amplified flute, violin and percussion. CME premiers Conrad Winslow's the perfect nothing catalog with support from the Jerome Fund. The perfect nothing catalog references the structure of Caryl Churchil 's 2012 play Love & Information, in which a large thematic arc is drawn by tiny non-repeating miniatures. It was also inspired by Frank Traynor's the perfect nothing catalog which interrogates the power of curation and restricted control in the making of things. 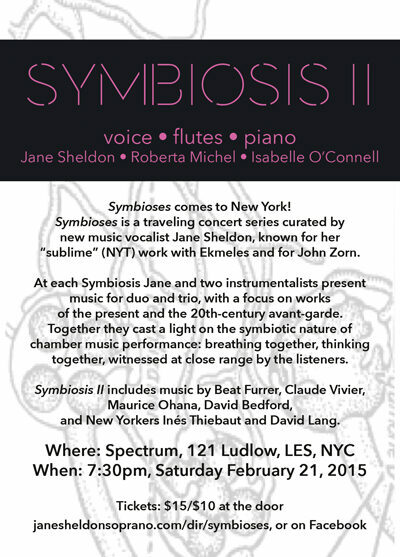 CME will also perform works by Inés Thiebaut and Andrew Struck-Marcell. As the leaves of the trees in Prospect Park start to turn, I gear up for a busy Fall. Busy indeed since I starting working as the managing director of the SEM Ensemble in the early summer. Perks: had a lovely conversation with George Lewis as we walked up slowly Joralemon St to Borough Hall. A total treat. Busy, yet excited to be working with fabulous trombonist David Whitwell on a new piece for low brass trio, with Maestros Dave Taylor on bass trombone and Jay Rozen on tuba. The piece will be premiered sometime in the Spring, 2015. 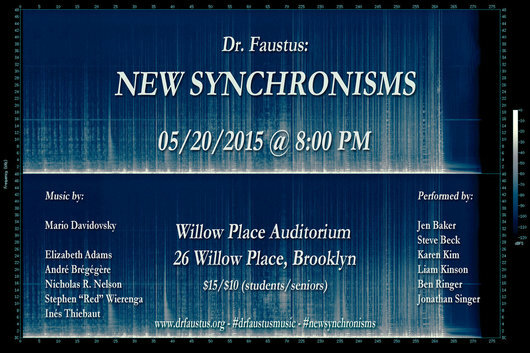 I'm also working on a new piece for Ensemble Mise-En, to be premiered as part of the Graduate Center's Composers Alliance spring concert in May, 2015. And very thankful to Mary Hubbell and Alice Jones for still touring my piece cuncta fluunt. This time, with dance! (Tamora Petitt, choreography). "Men perish because they cannot join the beginning with the end." My piece tonight does not join the beginning with the end (in fact, most of my music never does this) - its journey is a constant forward." Thanks to the Cadillac for a wonderful performance!